Do you use Facebook advertising for your business or organisation? Or are you considering using Facebook advertising to counter the effect the new algorithm is having on organic reach? Well here's a few things you may not know about Facebook ads that could potentially offer you an even smarter way to advertise. Most people will often use Facebook Ads to target their potential customers, relying on the 'Interests' and other demographic data to refine their targeting and hopefully get their advert seen by an audience who is relevant and likely to purchase their product or service. There's nothing wrong with this strategy, but it does rely on people being open about their personal data and interests on Facebook in the first place, and there is a better way... with Custom Audiences! A custom audience is Facebook's way of letting you promote your Facebook page or website to a group of people you specify, rather than letting Facebook decide who sees it based on some criteria you have set. You can utilise custom audiences in a number of ways and I'll look at 2 of the more common ones here. The first is by using your existing database of email addresses. By uploading your email addresses into Facebook, it will check them against Facebook accounts using the same email address and build you a list of Facebook accounts that can be targeted with your adverts. You can do this from a .CSV file or direct from your MailChimp account. People who are already on your mailing list are 'warm' leads and will be likely to 'Like' your page or visit your website, making your campaigns for effective. The second way I'm going to mention is a little more technical and will require a web developer to add a snippet of code to your website (unless you are comfortable doing this yourself), but is really useful if you don't have a database of email addresses. By adding a piece of code to your website, you can then target people who have visited your website whilst being logged in to Facebook. You can even specify the page on your website they must have visited before they see your adverts. Using this technique means you can set up campaigns for each product or service you provide and target people who have visited the corresponding page on your website. This technique is known as 'retargeting' as you are targeting the same people again. Retargeting is very effective at increasing conversion rates as it reinforces the messages they have seen before and means your brand becomes familiar. When people visit your website they may not be ready to buy, whether that's because they are still in the research phase of the buying process or maybe they get distracted easily. Either way, by presenting them with your brand again, you are reminding them of their visit and their original intention and wouldn't you rather it was you doing the reminding instead of your competitors? 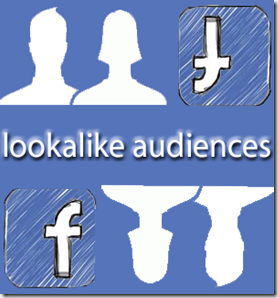 As an extension of Facebook's custom audiences, you can create 'Lookalike Audiences'. A lookalike audience is when Facebook takes the data from your custom audience and matches it with other Facebook profiles with the same characteristics. Using this type of audience means you won't be targeting people who are already on your database or who have already visited your website, but you will be targeting others who are similar and more likely to to visit your website or like your page because their characteristics match those of others who already have. If you'd like to take your Facebook Marketing to the next level, see the courses we have on offer.